A pastor arrested Monday for protesting Warner Robins High School's "Demon" nickname and mascot says he was just standing up for Jesus -- and he'd do it again. Pastor Donald Crosby said the school's demon logo just encourages children to evil. "I don't scare easily. Lock me up as many times as you have to lock me up. Even kill me if you have to. I'm standing up for Jesus." He criticized other Christians who, he says, are singing in church while their children are being taught to praise demons. "Demons aren't lazy, Christians are," he said. He said the city of Warner Robins must repent for its demon-praising. Crosby is pastor of Kingdom Builders Church of Jesus Christ in Macon. Warner Robins police spokeswoman Tabitha Pugh says the 36-year-old Crosby was arrested after police told him he didn't have a picketing permit, as required by the city. Crosby and the group protested outside the school on the opening day of classes. Last month, Crosby started a petition to remove the demon as Warner Robins High School's mascot. But others started a petition in favor of keeping the demon. School officials say they have no plans to change the name. The mascot honors a World War II fighter squadron nicknamed the "Screamin' Demons." 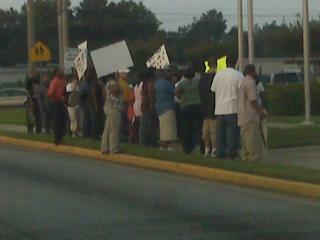 Warner Robins police say they tried to work with the pastor to make the protest legal. Pugh said, "Our officers asked him several times, it wasn't just once, several times to leave the property and go and obtain a permit, to say they can legally and lawfully protest." She says officers asked Crosby and the group to leave. Crosby refused and was arrested, she says. Others in the group dropped the protest. Pugh says Crosby is charged with picketing without a permit and disorderly conduct for not leaving when asked. Crosby was released from the Houston County jail on bond. Greg Green says he was dropping his daughter off for the first day of classes at Rumble Academy around 7:10 a.m. when he saw about 30 protesters outside the front of the high school. Green says the group wasn't blocking the school entrance or the flow of traffic. Green says some of the signs said things like, "Demons don't like me, because I'm Christian", and "Home games will have to be played in hell." The pastor says a 15-year-old, who he has legal custody of, is zoned for the school, and he doesn't want him exposed to the name's evil connotations. The boy, who Crosby would not identify, did not start classes at Warner Robins High, Monday. Crosby says he is considering "other options" for the child's education. Crosby says the 9th grader has received threats since he began protesting the demon mascot.